This retirement book focuses on the personal dimensions of the move from full-time work to partial or full retirement. Drawing upon conversations with retired professionals from around the country, it identifies some of the key transitions in the first years of retirement, the unique opportunities for personal growth in this phase of life, and the real challenges we must face. 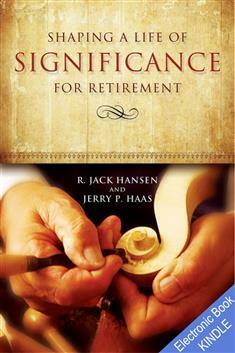 Retired engineer Jack Hansen and spiritual formation leader Jerry Haas explore the transitions, opportunities, and challenges of facing retirement through a series of interviews with persons facing and in retirement. It is about the more personal dimensions of the transition from working full time to retirement, including relationships, feelings of self-worth and purpose, and spiritual and intellectual growth. Taken as a whole, the conversations and interactions with retirees suggest an exciting and challenging picture of retirement. This time of life can be one of significant personal growth. It can also be an opportunity for further contribution to one's professional field or the investment of one's talents and experience in volunteer capacities. It is also clear that moving from full-time work to retirement involves important and sometimes painful adjustments in key relationships and in sources of self worth. With some attention and effort, however, these are usually worked through successfully in early retirement years.